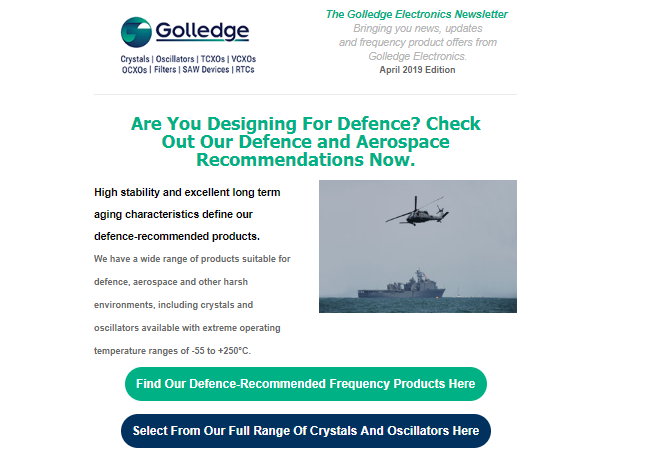 If you're designing for the defence sector, or for a project operating in harsh environments, then check out Golledge's April newsletter, featuring our recommended frequency products for defence, aerospace, and extreme environments. We'll also be exhibiting at PCB Design and Manufacturing Live on the 9th of May 2019 at Silverstone Race Circuit. Check out our newsletter to claim your free tickets to the event which is co-hosted with the FAST and Engineering Materials Live exhibitions, ideal if you're at the prototyping stages for your next design. Even better, with your free ticket you get free refreshments to enjoy at the event! Don't forget our New Designs Focus Catalogue for 2019 is available here to help you find the frequency products you need for your designs in 2019.